Computing & Technology > Tooting My Own Horn! Anyone who knows me knows that if I bang a nail into a wall the wall will fall down! Heck, as it is just look at the way I hang pictures!! Then the Internet came along and slowly but surely I was driving Chuck crazy( ier !) Actually it was his fault as he got me started on the Internet. By the 5th time I emailed him, and he answered " Goggle it", I learned to google it though I have since changed to bing. Then there is poor John who I bother all the time with Internet questions. Today I got a new 27" computer monitor and, FOLKS, I got it all put together and working without help from anyone! Okay, I won't tell about not being able to find the stand and the cables because taking the monitor out of the box I somehow tossed them under the sofa. Oh yeah let's forget my calling the store ranting and raving!! Good thing I was put on hold waiting for the manager because I spotted them so I quickly turned the phone off. 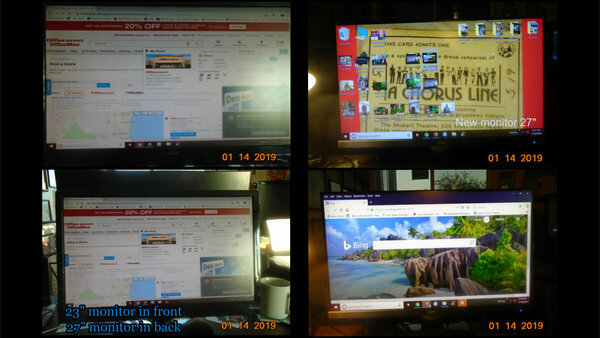 I have made fonts too big and had to figure out how to fill the screen and a few other things BUT I GOT IT WORKING WITHOUT CHUCK, JOHN, GOOGLE OR BING!